While on a week-long trip back to Fort Collins, Colorado, I took a flight lesson with a good friend of mine who happens to be a CFI. Since I have been working towards my high performance rating, we had originally planned to do the lesson in a C182. However, I apparently took some Alaska weather down to Colorado with me, which made me feel right at home, but which also caused some unforseen problems. After postponing for two weather days, and dealing with a pair of hangar doors that were frozen shut, we decided to shift our focus to the only airplane that we could manage to get free, a Citabria 7GCBC. I’d been planning to work on my tailwheel endorsement at some point in the near future, but I just haven’t made the time to get over to the airport and start. Needless to say, I was overjoyed by this stroke of good fortune. Before pulling the plane out, my instructor Dan gave me about 45 minutes worth of ground instruction, going over the different aerodynamic forces and principles that apply to flying tailwheel aircraft. Since I had studied these concepts in my Jeppesen flight manuals for my private license, I understand the causes and effects of P-factor, Gyroscopic precession, Torque and Spiraling slipstream, but I found it helpful to have them explained and illustrated by Dan. He also showed me a really cool equation (V₂/V₁ = √W₂/W₁) for converting the typical aircraft speeds to their optimum values based on true aircraft weight in relation to gross weight. I’ve never been particularly ‘mathy,’ but I suppose it’s because I never really had real world uses for things like quadratic equations. Seeing an actual useful application for something like this makes math much more exciting. After the lesson, we got in the plane and taxied out to the active runway. It was my first time controlling a moving taildragger and I seemed to do pretty well, managing the rudder pedals with smooth authority when necessary to keep the plane going straight. I learned that even though the tailwheel itself is controlled by the pedals, much of the steering at low speeds on the ground is caused by the propwash over the rudder. After our run-up, we taxied out onto the centerline. I smootly applied full power, waited until a count of three and then pushed the stick all the way forward. The tail rose quickly off the ground and the pitch attitude of the aircraft suddenly rose to a wings-level position. As the effects of gyroscopic precession kicked in, I applied right rudder to counter the left turning tendency. Dan took control for a few seconds so that I could glance over and note the position of the wings in relation to the horizon. One thing about the Citabria is that it has great forward view. With the runway now in full view in front of my face, I kept the plane in that pitch attitude by slowly applying back pressure on the stick as we picked up speed, and before long, the wheels left the ground and we began our climbout. I managed the pitch of the climb by adjusting the trim knob, which is right there on the left. It’s very easy to control and I was quickly able to set it so as to maintain neutral position on the stick. We ascended to about about 7,500′, which in Fort Collins is about 2,500′ AGL, and flew a few miles away from the airport. It was a pretty special experience to look around me and see the snowy Northern Colorado landscape below me. I had lived there for thirteen years, and now here I was flying an airplane above my old home. Once we stabilized at our desired altitude, Dan had me do some airwork, so that he could get an idea of my flying skills, and also so that I could get used to how the Citabria handled. We did some slow flight and a few power-off stalls, both of which I easily managed. Dan was pleased with my rudder work, which has improved greatly since my lesson in the 182. Overall, I found that it was a pretty easy, and very enjoyable aircraft to control, and I pulled out of our stalls smoothly with no trouble. This was my first time flying with a stick instead of a yoke, like I’m used to on the Cessna’s, I made the transition with very little trouble. In fact, every single element of this flight was different than I was used to: different type of aircraft, steering and throttle control with opposite hands, flap bar instead of a lever on the panel, different radio frequencies, different call sign, airport name and runway numbers, and of course, different visual scenery. I seemed handle everything just fine, and I relished in all the additional mental juggling. I did about half of the radio calls, while Dan did the other half so that I could concentrate on just flying the aircraft. After our airwork exercises, we flew back to the airport to do some touch and go landings. We started with a three point, which went pretty well, and then worked on wheel landings. Dan had me do a couple of high speed taxis after landings to get additional practice keeping the airplane straight on the runway, and for the most part, I did pretty well. We curved gently back and forth across the centerline a couple of times, but there was no swerving or hard turns. During our ground lesson, Dan had drilled into my head that if I did find myself swerving too much, I should simply apply full power. The aircraft would be close to flying speed anyway, and getting it quickly back in the air would be the safest course of action. Fortunately, we didn’t have to do that. We did have one pretty good bounce, and from the back seat, Dan took over and initiated the go-around by pushing the throttle all the way in. I made sure on my next pass to stabilize my descent speed, which, on the Citabria is very easy to do with the trim knob. That made the difference and my next landing was much more controlled. I finished out my fifth and final landing with a near perfect three-point, which provoked an excited response from Dan. I felt his hands grab my shoulders as he congratulated me. Since we’ve been friends for a long time and have always talked about flying together, it really meant alot to me, and probably to him as well, to be able to finally go up and gain some aviation knowledge from him. 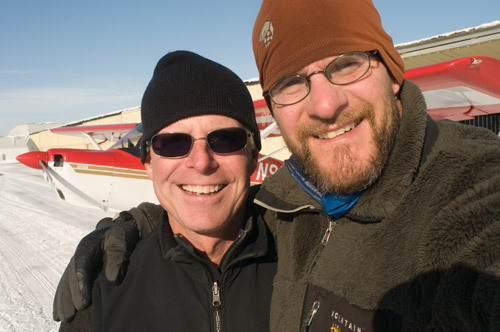 Of course, now I’ve opened up a new can of works with the taildragger thing, and I can’t wait to get back to Alaska and continue working towards my endorsement with my private instructor, Mark. I may have to wait until after the holidays are over, but at least I feel that I have a good start. The day ended when my other friend Paul, a longtime pilot flew down to the airport and picked me up in his Luscombe. We flew for another hour and a half all over the areas around Fort Collins. He pretty much let me steer the whole time and so I flew over my old house and practiced my stick and rudder skills while he looked out the window and took pictures. It was a very cold flight in the barely heated old plane and by then the wind had really picked up. Paul took over for the landing, which was just fine by me. He’s got his own grass strip on his property and he’d spent the morning packing down the runway by driving back and forth on it with his truck. After being pushed by the high winds and going around twice, he finally slipped in, straightened out and set his 8×50 bush wheels down on his snowy runway, which was, in fact, plowed to a width that was no wider than the wheel base of his Lucsombe’s landing gear. I was impressed. So much so, that I forgot to take any pictures. He’s the epitome of a local who is playing literally in his own backyard. If someone ever makes a ‘Bush Pilots of Northern Colorado’ video, he’ll certainly be in it. This entry was posted in Flight Lessons and tagged Citabria, Colorado, Fort Collins, tailwheel. Bookmark the permalink. Thanks for sharing a great story! I learned to fly tailwheel in a Decathlon (Citabria’s big brother). They are great planes! The next thing you’ll want to do is aerobatics… well I did anyway! Even though a Decathlon or Citabria aren’t rare planes, you get a lot more attention when you taxi onto the ramp in one, especially if you climb out wearing a parachute. I’ve now flown many tailwheels, but I miss the simplicity of the Decathlon. 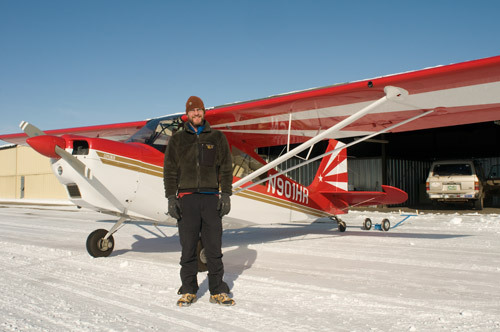 The first time I jumped into a Cub after flying the Decathlon, I thought it was broke. It didn’t taxi anywhere near as easy. Only one thing surprised me in your post. You mentioned you pushed the stick all the way forward during takeoff. Was this to hold the plane on the ground? I was taught to just relax the pressure on the stick and maybe gently push it forward a few inches. I’m not saying your way is wrong, just wondering! Jack, this particular instructor had me push the stick all the way forward, and then ease back as we gained airspeed. The method here was to get the tail off the ground as quickly as possible, so that I could learn to compensate for the left turning forces, and yes, to keep the plane on the ground so that we could do some high speed taxiing and see how the aircraft traveled down the runway in a level attitude. That said, as soon as we built up airspeed, I did have to pull back on the stick in order to compensate for the change in pitch due to the increasing speed. By the time the plane was at takeoff speed, the stick was definitely not all the way forward. That makes sense. I just remember getting drilled. “Keep the stick in your gut” stil llngers in my mind!! That was only when adding power though and the method your instructor uses will work fine. I now fly Powered Parachutes, but I spent many hours in the Decathlon. I don’t miss General Aviation overall, but some days I do miss looping and rolling the Decathlon. What a cool plane! Dan, the excitement and perspective you have of aviation is very outwardly shown. It was indeed a pleasure to fly with you. Your excitement is certainly contagious. With regards to Jacks question, you are pretty much on the money with your response. We teach this method of getting the tail up early in the take off roll to allow better rudder authority for steering and of course this gives much better over the nose visibility. The key is to raise the tail after enough forward speed is gained so as to allow the elevator enough effectiveness to raise the tail. This timing is different in the various types of airplanes and with varying weights in the same airplane. We do hold the stick full back until that speed is reached, then apply forward stick smoothly and relatively quickly to the point where the wing has a zero angle of attack. This allows the airplane to build enough airspeed in an attitude that lets you determine when to let it fly, by subsequently raising the nose when the proper rotation speed is reached. Since you have trimmed the aircraft for a departure speed and pitch attitude, you actually are just releasing the forward pressure, or just slight back pressure on the stick to let the nose rise.This is also a great technique for gusty days with crosswinds. A tail low attitude works too as one gets more proficient. Keep flying and writing Dan.